The Sunset Limited route starts in New Orleans and ends in Los Angeles (or vice versa if you are travelling the other way) its principal stops being in Houston and San Antonio. It happens to be Amtrak Train Number 1, as well as being the first route on my trip around the US. The scenic highlights mentioned in the Amtrak timetable include the Gulf Coast, Mexican border, Bayou Country and the Southwestern desert. On this leg, I’m only expecting to see the Mexican border and desert scenic views, catching the Gulf Coast and Bayou country on my final stretch from New Orleans to Houston. 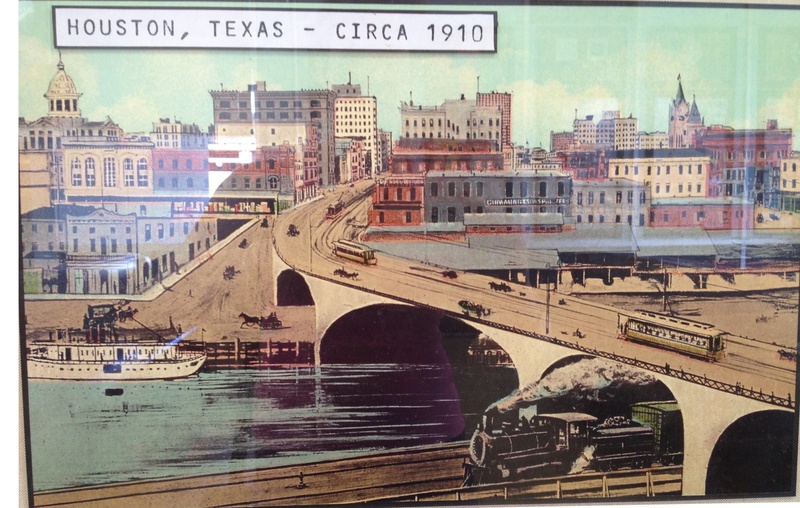 While waiting for the train in Houston, I found this picture of the city painted in 1910, and according to the words underneath it, the tracks on which the train in the picture is running are the same tracks I travelled on leaving Houston. The skyline has been modernised, maybe some time I’ll take this picture and explore down-town to see whether any of the identifiable buildings are still around.